If you don't know by now what this hit TV series is about, then you've probably been, well, stuck on a desert island for the past few years. To recap: forty-eight passengers en route from Australia to the States narrowly escape death when their plane crashes onto a deserted tropical island. But Lost isn't quite a 21st century retelling of Robinson Crusoe or a fictionalized version of Survivor though: something creepy and downright weird is happening on the island. For starters, there's the miracle of the paralyzed passenger who can walk again. Then there's the polar bear which attacked a group of survivors. Polar bear? Yup, and it gets weirder: there's also some kind of giant man-eating creature trampling trees in its path (is it a dinosaur?) and a transmitter broadcasting a distress signal by a French woman stuck on the island from an earlier shipwreck 16 years ago; not to mention what appears to be ghosts . . .
Internet fans are abuzz as to what exactly is happening on the island. Is it a government conspiracy? Aliens? Maybe it's all in their heads. Or maybe they're all dead, and in Purgatory. The show's otherworldly atmosphere is further enhanced by the fact that Lost was filmed on the same Hawaiian locations used for Jurassic Park. A surprise hit, Lost is a breath of fresh air on TV: it isn't a lawyer or cop show, and there isn't a starship captain in sight. With a story arc recounting one story line, the show doesn't really have any self-contained episodes. Miss an episode and you'll lose the thread of things (characters tend to get killed in the show). THE DISCS: You get the entire first season on six discs. The seventh disc consists entirely of extras such as making of features, deleted scenes and even the actors? audition tapes. The image is in widescreen unlike the full-screen in which it is usually broadcast on TV. This lends a more ?theatrical? feel to the series, and makes it feels less like television. The 5.1 sound has a nice dimensionality. WORTH IT? With a fresh-faced cast (except for that guy who played a hobbit in the Lord of the Rings movies) and some clever writing, Lost features the sort of unpredictable, character-driven drama and adventure that makes for addictive viewing. It is ideally suited for the DVD format: you won't have to wait until next week to see what happens next ? just pop in the next disc or flip to the next episode. The only problem that Lost faces is its own success. 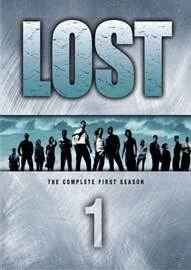 With the highly anticipated second season showing on American screens and a third season already in the pipeline, Lost seems to be in it for the long run. To extend the show the writers might just end up discarding whatever story arc they originally planned for the show and wind up writing themselves into a corner. 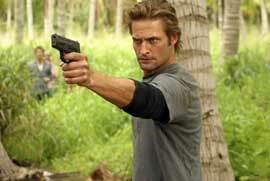 Lost might end up like the X-Files in which viewers soon realized that nothing will ever be explained or wrapped up satisfactorily and eventually stop watching it altogether. NOTE: Is Lost sci-fi? I believe so, even if the show's marketing may not like presenting it as such. It does have an otherworldly vibe somehow similar to author J.G. Ballard's work to it.